Vector software tools offer system architects, network designers, development and test engineers comprehensive support for the entire development process: from system design and integration to testing, calibration and diagnostics of single components or the entire system. Optimally coordinated software tools create simplicity and enable you to reduce development costs while maximizing cost efficiency and quality - in the automotive, aerospace, medical, rail technology and other industrial sectors. ASAP2 Lib is a powerful and easy-to-use function library, which you can use for reading and writing standardized ECU description files in ASAP2 format for your own applications. All versions of the ASAP2 standard released by ASAM are supported for reading, including the current version 1.70. Both fixed parts of the ASAP2 specification and variable parts that are defined by the ASAP2 metalanguage can be read in. One prerequisite for using CCP and XCP as measurement and calibration protocol is the existence of an ASAP2 description file. The ASAP2 Tool-Set is used to create and check this file. The six console programs are configured using initialization files and can thus be easily integrated in batch and make processes. The ASAP2 Editor also provides you an additional convenient tool for entering and editing all information via a dialog-based user interface. CANalyzer is the comprehensive software tool with intuitive operation for analysis and stimulation of bus communication. Use CANalyzer to check whether and what type of communication is occurring on the bus. It can also be used to send or log data. For every application it offers powerful basic functions for beginners as well as extensive detailed functions for experienced users. The primary application area of CANape is in optimizing parameterization (calibration) of electronic control units. Calibrate parameter values and simultaneously acquire measurement signals during system runtime. The physical interface between CANape and the ECU might be made via the CAN bus with CCP or XCP, for example. The specification tool CANdelaStudio is a central component of the CANdela solution and supports users in creating and editing a formal ECU diagnostic specification. CANdesc (desc = diagnostic embedded software component) is the ECU diagnostic software component in the development process of the CANdela product family. CANdesc enables vehicle and electronic control unit (ECU) manufacturers to implement the diagnostic protocol uniformly across different OEMs and their vehicle lines. CANdesc supports diagnostic communication via CAN, MOST, FlexRay. Any other bus system will be also supported using an optional abstract transport layer interface. DiVa is a CANoe extension for automated testing of diagnostic software implementations in ECUs. Reproducible test cases are generated based on an ECU diagnostic description. CANoe.DiVa consists of a configuration tool with a dedicated user interface, test case generator and runtime library for extended CANoe test functionality. During the development of an ECU it is necessary to perform extensive CAN conformance tests. The CANoe Test Package VAG creates a CANoe configuration for this purpose. The configuration includes test implementations according to the corresponding Volkswagen test specifications. The tests run fully automated and may be repeated at any time. Thus, the test effort is kept to a minimum. DaVinci Configurator Pro lets you configure and generate AUTOSAR basic software (BSW) and the RTE for your ECU – whether they are BSW modules from Vector (MICROSAR) or third party producers (e.g. MCALs from semiconductor manufacturers) or even BSW modules you have created yourself. The multi-stage and rule-based validation process ensures inter-module consistency of all configuration parameters. 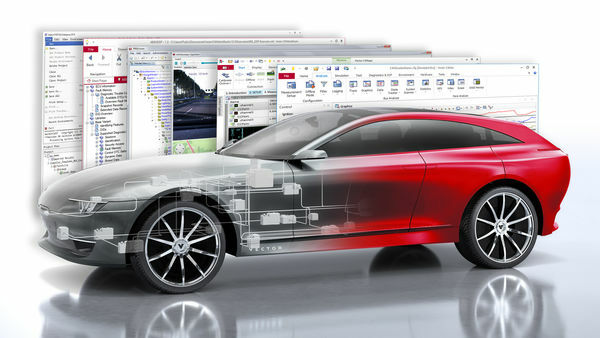 DaVinci Developer is the professional tool for designing AUTOSAR Software Components (SWCs). Using convenient graphical editors, you can design the structure and interfaces of the functional software of your ECUs quickly and clearly which ensures a smooth integration of the functional software with the ECU’s basic software. Indigo is an easy to use diagnostic tester that is largely self-configured and conceals the complexity of the diagnostic protocols. It gives the user a quick overview of a vehicle’s status and allows detailed diagnostics of individual ECUs. A wide variety of applications of vehicle and ECU Diagnostics are directly represented by Indigo. This makes handling of the various diagnostic tasks very convenient, and easy to perform with a minimum number of user interactions. MDF4 Lib is a powerful function library; in its base variant you can use it to sort MDF files and read them into your own applications. The new ASAM-standardized MDF4 is supported in addition to the widely used MDF3 format. The library offers a convenient C++ interface for easy access to signal data and supplemental information stored in an MDF file, regardless of the specific MDF version (3.x/4.x). ODXStudio is a user-oriented authoring tool for diagnostic data in ODX format. As the optimal platform for a native ODX process, it offers full support of ODX data of all categories. The PREEvision E/E engineering solution is the premier tool for model-based development of distributed, embedded systems in the automotive industry and related fields. This engineering environment supports the entire technical development process in a single integrated application. Squore is an innovative decision-making dashboard that enables quality management of software development. The TA Tool Suite is part of the Vector product family since 2018. It offers a wide range of tools for the design, simulation, optimization and verification of embedded real-time systems. As a one-tool solution, it covers the non-functional requirement “timing” across the complete development cycle. The expert mode enables a deep analysis of the timing behavior. Furthermore, it simplifies and semi-automates the application software distribution in multi-core processor ECUs. Additionally, the TA Tool Suite increases the efficiency and reactivity of real-time multi- and many-core systems. vADASdeveloper provides an infrastructure for developing algorithms for advanced driver assistance systems and automated driving. The tool reduces your workload in developing sensor data fusion applications. The runtime environment acquires sensor data, logs it and can replay the data for stimulation. vCDM is the database-supported platform for calibration teams. The intuitive guided user mode helps calibrators to get familiar with vCDM. An expert user mode is optimized to efficiently process calibration data in large projects. Work results are efficiently merged, and potential data conflicts are avoided or detected and resolved. All data changes are seamlessly tracked. The VectorCAST embedded software testing platform is a family of products that automates testing activities across the software development lifecycle. vFlash is a very easy-to-use tool for programming ECUs. It supports already more than 50 different flash specifications and is simply expandable via a plugin concept. vFlash is designed for all users at automotive OEMs and suppliers whose tasks include (re-) programming of ECUs. It supports ECU programming over CAN, FlexRay, LIN, and over Ethernet (DoIP). vFlash allows users to flash ECUs in the laboratory, at programming stations, at a laboratory vehicle or in the vehicle very efficiently. vMDM (Vector Measurement Data Management) is the solution for efficient management of large data volumes from development, test bench operation and vehicle tests. The vMeasure CSM measurement and analysis software is the ideal supplement to CAN- and EtherCAT-based measurement modules of CSM. vSignalyzer is a convenient tool for efficiently evaluating measurement data of all types. It gives you extensive options for visualizing the data as well as functions for manual and automated analysis and reporting. Measurement data acquired in network development, analysis and ECU calibration may be read-in from various file formats. vTESTstudio is a powerful development environment for creating automated ECU tests. In order to increase the efficiency in terms of test design and to simplify the reusability it provides either programming-based as well as tabel-based and graphical test notations and test development methods. vTEStstudio can be employed in all product development phases: from model testing right through to system validation. Thanks to the use of open interfaces vTESTstudio can be simply incorporated into existing tool landscapes. vVIRTUALtarget is a software that is used to generate virtual ECUs for all typical AUTOSAR-4 projects. It supports function and software developers, software integrators and test engineers throughout the entire ECU development process.